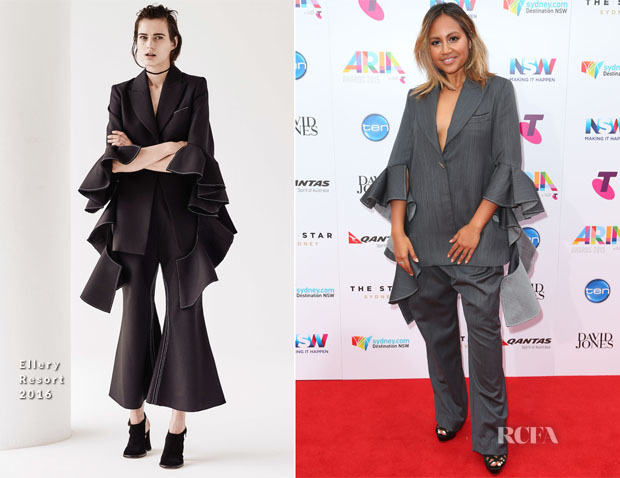 Jessica Mauboy attended the 2015 ARIA Awards held at The Star today (November 26) in Sydney, Australia. The singer is the one person I look out for at this annual event, so I was surprised that she selected this grey Ellery Resort 2016 look. We’ve seen some poor oversized suits courtesy of Cate Blanchett this year, but this beats them both. What looks stylish and fashion forward in the look book, comes across as sloppy, ill-fitting and awkward on Jessica. Not one part of this is working in her favour. I read that Jessica recently fired her stylish; so I think it’s safe to say we all know who is having the last laugh.